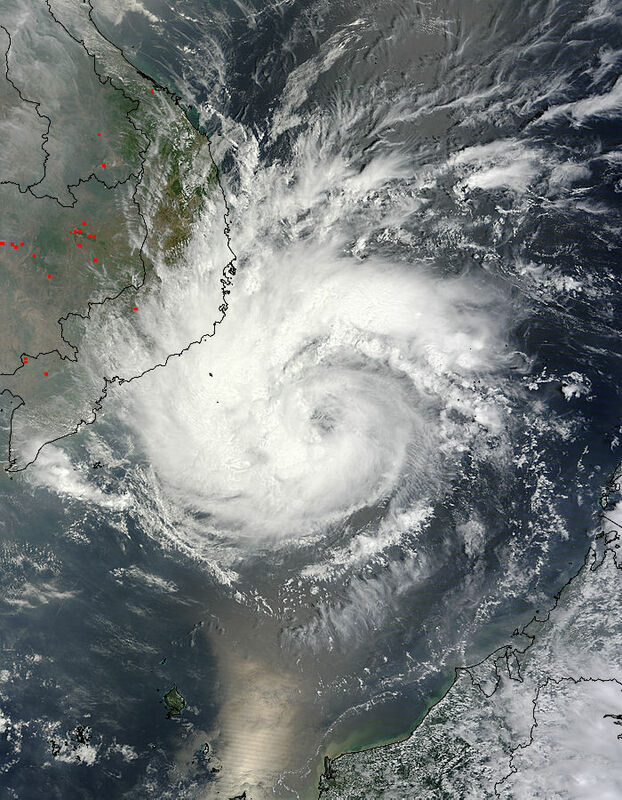 The MODIS instrument on NASA’s Terra satellite captured a true-color image of Typhoon Pakhar on March 30, 2012 at 03:20 UTC (March 29 at 11:20 p.m. EDT) moving through the South China Sea toward Vietnam. The Tropical Rainfall Measuring Mission (TRMM) satellite flew almost directly over Pakhar when it was a newly formed tropical storm in the South China Sea on March 29, 2012 at 1122 UTC/4:22 p.m. Asia local time (or 7:22 a.m. EDT). The intensifying storm had wind speeds of about 45 knots (~52 mph/~83 kph) and was moving toward the west-northwest when viewed by this TRMM pass. A rainfall analysis used data from TRMM’s Microwave Imager and Precipitation Radar (PR) instruments. It showed that moderate to heavy rainfall of about 35 mm/hr (~1.4 inches) was located in an area around Pakhar’s southwestern side. "TRMM’s PR was used to create a 3-D image of Pakhar’s structure and showed that some of the storms were reaching heights of about 13 kilometers (~8 miles) above the ocean surface," Hal Pierce of the TRMM satellite team at NASA’s Goddard Space Flight Center in Greenbelt, Md. where the images were created. The Moderate Resolution Imaging Spectroradiometer (MODIS) instrument on NASA’s Terra satellite captured a true-color image of Typhoon Pakhar on March 30, 2012 at 03:20 UTC/10:20 a.m. Asia local time (March 29 at 11:20 p.m. EDT) moving through the South China Sea toward Vietnam. Bands of thunderstorms are tightly wrapped around the center of Pakhar’s center, and there may be an eye forming, but it is covered by dense overcast in MODIS visible imagery. On March 30 at 0900 UTC (5 a.m. EDT) Pakhar’s maximum sustained winds were at Typhoon strength, near 65 knots (~75 mph/120.4 kph). Pakhar is expected to intensify to 80 knots (90 mph/148 kph). Tropical-storm-force winds are occurring about 90 nautical miles (166.7 km) out from the center. Pakhar was located near 9.7 North and 111.0 East, about 260 nautical miles (481.5 km) east-southeast of Ho Chi Minh, Vietnam. Pakhar continues to move slowly at 3 knots (3.4 mph/5.5 kph), which will allow more time for the typhoon to build up strength in the warm waters of the South China Sea. As Pakhar continues to intensify while moving slowly west towards Vietnam, forecasters at the Joint Typhoon Warning Center expect the storm to peak near 80 knots (90 mph/148 kph) before landfall. Landfall is forecast to occur near Phan Thiet, Vietnam around 1 a.m. Asia/Ho Chi Minh local time on Sunday, April 1 (1800 UTC / 2 p.m. EDT on Saturday, March 31). For updates from the National Hydro-meteorological service in English or Vietnamese, visit: http://www.nchmf.gov.vn/web/en-US/104/102/12017/Default.aspx; and for a map of warning areas, visit: http://www.nchmf.gov.vn/web/en-US/43/Default.aspx. Conditions continue to deteriorate in Vietnam as Pakhar moves toward the coast. On March 30, 2012 at 10:26 a.m. EDT (1426 UTC), Phan Theit, Vietnam was experiencing light rain and light easterly winds of 4 mph (6.4 kph). Typhoon-force winds, heavy rainfall, and very rough coastal conditions are expected as Pakhar nears the coast later today, Saturday and Sunday. After landfall, Pakhar is forecast to move inland and dissipate quickly.